Shri Thanedar, an Ann Arbor Democrat, wants to raise taxes on the rich to pay for investments to schools and roads. Democrat Shri Thanedar says he would dramatically increase taxes on the wealthy to pay for improvements to schools and infrastructure if elected Michigan governor. 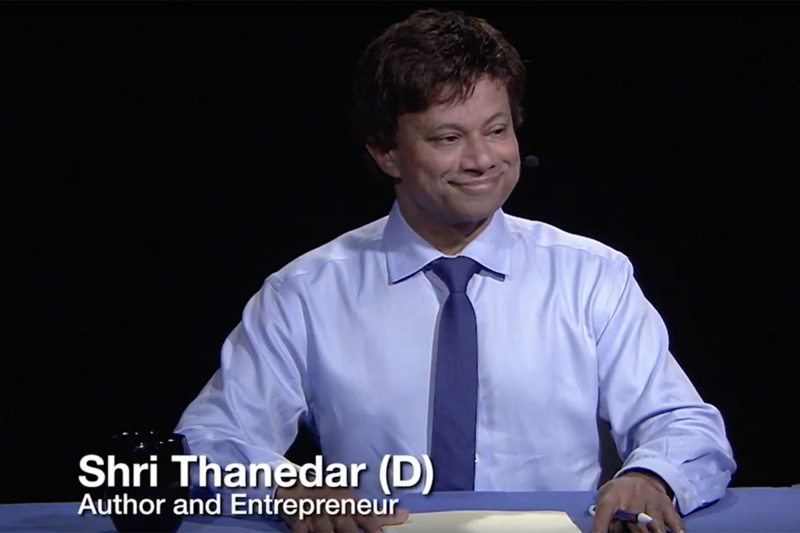 Bridge Magazine interviewed Thanedar, an Ann Arbor entrepreneur, for more than an hour last week along with its partners in the Detroit Journalism Cooperative: Detroit Public Television, Bridge Magazine, Michigan Radio, WDET Radio, New Michigan Media and Chalkbeat Detroit. All Democratic and Republican candidates were interviewed, except Attorney General Bill Schuette, a Republican who said he has a scheduling conflict. The primary is Aug. 7. What follows is a transcript of Thanedar interview. Any grammatical and spelling errors are those of the transcription service. Ed Moore, Detroit Public Television: Welcome, Shri Thanedar. Thanks so much for taking part in our gubernatorial candidate interviews. I’m Ed Moore, Director of Content for Detroit Public Television. In the room today and doing the questioning are members of the Detroit Journalism Cooperative. The DJC is made up of six media outlets – Detroit Public Television, Bridge Magazine, Michigan Radio, WDET Radio, New Michigan Media, and Chalkbeat Detroit. And we’d like to thank the John S. and James L. Knight Foundation for its support on this project. Today’s panel includes, from this side over to here, Sascha Raiyn, Education Reporter at WDET representing Chalkbeat Detroit; Riley Beggin, Politics Reporter at Bridge Magazine; Stephen Carmody, Reporter and Producer at Michigan Radio; Hassan Khalifeh, Reporter for the Arab American News and New Michigan Media; and Sandra Svoboda, also from WDET-FM. For the next hour, each journalist will ask a series of questions and follow up on your answers if they need more specifics. So, we appreciate you keeping your answers as concise as possible so, we can get to as many topics as possible. I’ll give us a 30-minute time reminder so we can stay on track. So, we’re going to get started and I’ll kick off with the first question if that’s alright. Shri Thanedar: Well, one of my best skills are hiring best people. I have run small businesses for the last 26 years. I’ve grown businesses, won awards. A lot of it I couldn’t have done all by myself. And what was most important was my ability to go and find outstanding people to join my team. So, I always build great teams, given a lot of freedom to them. Once I craft out a vision and my goals, I would communicate my vision and goals to my team and let the team take over and let the team make things happen. That’s how I always do. As a governor, my lieutenant governor would have substantial State, House, and Senate experience. My chief of staff would have substantial government experience. I would pick good people from the government, from academia, as well as industry, to put together the best possible team that would complement my leadership abilities and leadership skills. Ed Moore: So, you’re a candidate for the Democratic Party, correct? Ed Moore: And as the leader of the party, should you be elected, do you see part of your role as staying in lock step with the Democratic Party’s agenda? Shri Thanedar: Yes. I would largely have a progressive Democratic agenda and I will work very closely with the party and the elected officials, the Congressional delegation, in setting up our agenda. And I will take my party’s advice as often as I need. Ed Moore: Do you see any place now in the agenda that you might deviate from? Shri Thanedar: Not really, I’m an extremely progressive candidate. We have a broad base agreement with the progressive wing of the party, as well as the establishment wing of the party. So, my policies, my positions on issues, are very much in line with my party. Ed Moore: Okay. We’re going to move on to questions about education and we’ll go now to Sascha Raiyn. Sascha Raiyn: Judith from our audience had a question about how you’ll handle schools. So, can you tell us whether you feel Michigan schools have what they need – the resources they need – to succeed and to serve all of their students including students with special needs? And also, do you feel Michigan schools are funded equitably? Shri Thanedar: Well, first, Sascha, I want to congratulate you and thank you for all the great work you’ve done with Detroit Public Schools and all of your research and your articles. Education was the ladder for my success. I grew up in poverty and I got a Bachelor’s and a Master’s degree in Chemistry and I immigrated to United States to get a PhD in Chemistry back in 1979. So, I understand the importance of education. And our education today has become a privilege. It’s become so expensive. A lot of that has to do with funding. We need to put more funds in our K12. We need to make our teachers – pay our teachers as the professionals that they are. Provide them enough support staff like counseling, mental health counseling in schools, career counseling. We need to invest in early childhood education. I have a grandson who is 18 months old and I see how young children learn. And we’re always worried about third grade math and fourth grade reading. But my focus is going to be taking early childhood education to 3-year-olds and 4-year-olds, teach them the math skills, the reading skills that they need, and begin investing our children very early in their life. Sascha Raiyn: Can I ask where the money would come from that you want to invest? Shri Thanedar: Good question. So, the current funding model is not working. I want to have the funding based on a need-based. So, students in public schools, the schools that have higher needs because – say, for example, charter schools, when they take students away from our public schools, it leaves behind harder-to-train students. And sometimes, especially Detroit public schools. There are a number of schools that have higher needs. And I want to make sure that the funding is in proportion to that. Some of my funding would come from a graduated income tax where the rich and the ultra-rich and the corporations would pay their fair share in terms of contributing to our revenue stream. The passage of the recreational marijuana bill, which I support, will generate about $125,000,000. Some of that money should be earmarked for the school fund. So, I’m proposing an education bank where the money that’s put in there cannot be used to balance the budget or administrative costs but should be earmarked specifically for school funding. Sascha Raiyn: I just wanted to ask. We are coming to understand really that tests in school are measuring more socioeconomic things than perhaps academic things. Should then the accountability standards – the way we measure schools, the way we hold schools accountable – should they be measured by these tests? Is there another way they should be measured? And should they then affect whether and how the State approaches school closings? Shri Thanedar: Again, I want to minimize the testing. I think we’re doing way too much testing that goes on. I would keep just one kind of testing three times a year and I want to use the testing for measuring the progress year over year. I would not use the testing to evaluate the teachers or close down the school districts. Often, I see – I’ve met with many teachers, I’ve had conversations. And what I have seen is that because the teachers are so afraid of the test results that a lot of their teaching is focused on students getting and doing better in test scores. And I want the teachers to focus on real learning. I want our children, when they get out of high school and assuming they don’t want to go to four-year college, they should be able to go in the marketplace and be able to find good-paying jobs. And what that means is then that we need to give them the skill set that they need whether it is technical education, vocational skills in middle schools or high schools. So, we need to give them their skill set and our education needs to have a curriculum not only it fits with a child’s aptitude but the curriculum must also allow and empower a child to be able to go in the marketplace and be gainfully employed. Ed Moore: Should the decision to close a school rest with the state? Shri Thanedar: The issue about school closing is that we should focus more on investing in that school. We should look at creating an infrastructure, a support structure, where the children can prosper. And school closing is not a solution. If a school is failing, that means we have failed. We have failed to adequately fund that school. We have failed to provide them the support staff that they need. It means we have failed to provide them the funds they need for their science projects or their security for the school. So, we really need to look at schools and see why they are failing and we need to provide them the resources. We need to help them as opposed to do this testing in a punitive way to close down schools or let go of teachers. Ed Moore: Steve Carmody from Michigan Radio has the next question on education. Stephen Carmody: Hello. The Detroit Public School Community District, the largest district in the state, recently released a report estimating the cost of bringing school buildings up to standard and it would cost about a half-billion dollars to do. Now, the deal that the District cut with the State prevents it from raising money like other districts. How much of that half-billion dollars is the responsibility of the State to cover to bring these buildings up to standard? Or should the State make it easier for the District to borrow money to pay for that? Shri Thanedar: I think the answer is both. There should be some State funding but local government should have freedom – local school districts should have the freedom to raise revenues locally. But the important thing is that we invest in schools and we bring the levels of all of our schools at the same level. I’ve seen – been to schools that look like a five-star hotel. And then, I have seen schools where it rains outside, you start seeing it’s raining or snowing inside the classroom. So, some of the schools are in bad shape and we need to strengthen our public education. If our public education is strong then, our communities are strong. Once our public education, our schools in the neighborhood become good, families will move into the neighborhood. Businesses will move into neighborhoods. So, it all starts with education. I want to be the best education governor Michigan ever had. And that means we start with investing and that means we fund it on a need basis, not on a zip code basis. Stephen Carmody: Just a quick followup. If Detroit needs that much help, how much should taxpayers in Grand Rapids, Mt. Pleasant, and the UP be contributing to improve Detroit schools? Shri Thanedar: Well, this governor came to Lansing saying he wants to run the business – the State as a business. And a state is not a business. You’re dealing with people’s lives, you’re looking at children’s lives. And even though I’m a businessperson, I have run businesses in the past, I come to this job looking at this job as running a state like a family. And when you talk about running a state like a family, as the head of a family, if a child has special needs, we go give extra love and care and compassion to that child. In the same way, we are all in this together. Michigan is one big family. And we need to look at each other – we need to look out for each other and we need to contribute. And so, I would not want regions to think more – a more protective way for their own regions but we need to chip in to make it better. And maybe Detroit would help the other areas at other times. But we are all in this together and I would like to run our state like one big family. Ed Moore: I’m going to move on now to some questions about charter schools and Hassan has our question about that. Hassan Khalifeh: Do you think Michigan should make any changes to laws regarding how charter schools are governed? Shri Thanedar: Absolutely. One is we need to hold high standards of accountability for charter schools just like we would hold for public schools. We also must make sure that no one profits from our public school dollars. So, I would like to gradually transition the for-profit charter schools to not-for-profit schools. That’s one of the things that I would do. I am a proponent of choice. I have no problem with having choice for parents on where they send their children and what kind of education they get. But we need to ensure that our school dollars are not going into the pockets of corporations as profits. Hassan Khalifeh: So, then, you wouldn’t support continuing to fund charter schools with the same money allocated for public schools. Shri Thanedar: Again, I want the funding to be more on a need basis. So, we need to revise this formula and use the limited resources the state has to provide them in proportion to the local needs. If we can bring some of our underperforming – severely underperforming – schools up to an average standard of what we would expect, the entire level of Michigan’s education will go up. And we can take Michigan education in the top 10 if we can focus on severely underperforming schools. Sascha Raiyn: How would you make preschool and childcare more available and accessible and affordable in Michigan? Shri Thanedar: Well, I am proposing that we have a universal childcare and I’m proposing that we have a universal pre-K. So, this will be a State-funded program. It is designed to help parents get back in the workforce since in the last 15 years, 300,000 women have been out of workforce because they cannot afford childcare. The cost of each child for childcare is ranging up to $10,000 a year. And that has become prohibitive for many women to be able to acquire gainful employment. So, my focus is on once the paid family leave gets passed, we will have early childhood education, as well as early childhood childcare. We will also raise – I want to raise the minimum wage to $15 and tie that to inflation. All of that would help working families and it will all help the single mothers and single fathers. And I know that. I was a single father and I raised my children when I lost my first wife. And I raised my children when they were 4 and 8 years old. So, I understand what a single parent goes through and I want to help them with a universal childcare and a universal pre-K.
Ed Moore: And then, we’ve got a question about higher education from Sandra Svoboda. Sandra Svoboda: We’ve covered a little bit about K-12 and that was early childhood so, I’m interested in higher education. If you think the cost of it in Michigan is prohibitive now and what, as governor, you could and would do about that. And that’s what I would focus on. I would make college affordable to any family that makes $120,000 or less should be able to send their children to college tuition-free. I would have incentives if the graduates stay in Michigan and work in Michigan. If they stay in Michigan and go into the teaching profession then, I would forgive their college debt over time. And if they stay in Michigan or start businesses and create jobs in Michigan then, I would also forgive their college debt over a period of time. Sandra Svoboda: Could you talk a little bit more about how you would pay for that? Money has to come from somewhere. How would you raise the revenue to pay for that from the State level? Or would you cut expenses somewhere else in the State budget? Shri Thanedar: Well, certainly. We need to look at – we have a $56 billion budget. We spend over $2.5 – almost $2.5 billion on the prison system. I want to do prison reform. I want to find a way for nonviolent offenders to pay their dues to the society in an alternate manner. We’re spending $41,000 per prisoner and we only have $9,000 or less per student, which that match jus doesn’t work for me. We need to have a savings there. We need to save on the corporate giveaways and tax incentives. I want to certainly ask for a 30-year, $30 billion, statewide municipal bond to pay for some of the infrastructure improvements. Certainly, the money and the additional revenue coming from marijuana recreational use should also be used in the school fund. So, it will be a combination of some tax increases on the rich and the ultra-rich and corporations. Some tax giveaways. For example, any family that makes $50,000 or less, I will eliminate State income tax for those families. So, we will reduce and eliminate the State income tax for families making $50,000 or less but then, we’re going to raise taxes for the rich and the ultra-rich and corporations who are not paying their fair share. So, there’ll be multiple ways I would generate revenues. Now, having run small businesses, I have an understanding about finances. And I’m the only gubernatorial candidate that has created jobs and run in a private sector and run businesses. So, I come to the job with that knowledge. Ed Moore: Okay. So, we’re going to move on to government. And before we turn to more policy-specific questions, I would like to ask you a question about the inner workings of Lansing. Michigan’s term limit will cause a mass turnover this year in both the Senate and especially, in the House. How challenging do you think it’s going to be to lose all that institutional knowledge? And as governor, how will you and your staff prepare to work with these new lawmakers? I think it’s good to have fresh ideas and new people coming in with new ideas. I have no problem with that. But they must not learn their knowledge and ideas from the lobbyists. Often, what happens is you have inexperienced lawmakers come into Lansing and they rely for information from the lobbyists and that’s the wrong thing to do. Lobbyists obviously have their own vested interests. And I want lawmakers to take their job seriously. I want them to study and I want them to be knowledgeable and I want them to listen to their constituents and propose legislation in line with my overall agenda. Ed Moore: But how, specifically, would you work with them? How would you engage this whole new class? Because they are going to be having lobbyists come to them. How do you get yourself in between them? Shri Thanedar: Well, you know, again, I go to Lansing beholden to no one. I have taken a pledge not to accept a single penny from a corporate special interest _____ . So, they will see that I am not beholden to anyone. And I will expect the same from the lawmakers. I want to hammer out good, positive solutions to Michigan’s complex problems and I want to partner with them. I want to work with them. I want to get experts in the area – not the lobbyists – but I would get education experts, I would get infrastructure experts, and I will listen to them. I will have sessions of lawmakers and experts in the field and we will talk about and we will look at different scenarios and hammer out the best solution for our state. Ed Moore: Okay. We’re going to move on to Riley Beggin from Bridge Magazine for questions about roads and infrastructure. Riley Beggin: Okay. So, we all know that Michigan’s roads are really bad. A task force says the State needs $4 billion more just to maintain our infrastructure here. How should Michigan pay to fix roads, bridges, and water systems? Shri Thanedar: Well, we need to invest. There are two different approaches. Bill Schuette would want to eliminate the income tax and he would want to cut and cut and put us on an austerity program. And such an approach will not work, has not worked in other states like Kansas and Mississippi. The other approach really is to invest. And if you see, most prosperous states do invest in infrastructure, they invest in education. A dollar invested today can give us $4, $5, $6 return down the road. And so, we need to have a leadership that is committed to investing into our infrastructure. We talked about a 30-year, $30 billion, statewide municipal bond. That will be serviced by the corporate graduated income tax on ultra-rich and corporations. So, we would also minimize any tax incentives, tax giveaways to big corporations. And some of that, we will have over $500,000,000 of savings. We would have some savings from our prison reform and that would also be used for servicing the 30-year bond. So, my focus is going to be on investment in our state. We cannot take our state to prosperity. We cannot take our state to the top 10 without investing in our state. And the austerity program that’s proposed by Bill Schuette and the Republicans will not work and such programs have not worked elsewhere. And if we have a Republican administration over the next eight years, all we will see is that our roads will get bad even further. We need to replace the lead lines not only in Flint but all across Michigan. You know, we need to have broadband internet in Northern Michigan. We need to work on mass transportation in Detroit. So, there’s a lot of investment we need to do in our state to encourage others to move into our state. We need to increase the population and the revenue base of our state. And it can only happen if people are new graduates stay in Michigan, other people come into our state. We have a beautiful state. We have great natural resources. If we can couple that with good infrastructure and great education, families will stay in Michigan, families will move into Michigan. That will raise our revenue base. Having a good education and skilled workforce and a good infrastructure, businesses will move in. So, this approach that Republicans have used to just give away money to get businesses to come in and set up a shop is a band-aid solution that will not work on a long-term basis. We’ve got to invest, we’ve got to take our education to the next level, we’ve got to take our infrastructure to the next level. And that’s the kind of big idea, big future governorship I would offer to the State of Michigan. Ed Moore: Okay. Before we move onto your next question, Riley, Sandy’s got a followup. Sandra Svoboda: I’m just interested. You’ve mentioned taxes on the ultra-rich and rich a few times now as a basis of economics, really. I’m wondering if you could tell us what income or wealth number is there and how that translates into dollars in the State budget. What’s kind of the multiplier on increasing taxes and what it means for State revenue? Shri Thanedar: We would start a slight increase in taxes at about $200,000 to $300,000 a year. Shri Thanedar: Household income. And then, we’ll gradually raise that up. So, I would, and my family would end up paying more taxes than we are currently paying. But I think this is an investment we make in our state. And without this kind of investment, we’re not going to take our state to the next level. Riley Beggin: I have a quick followup to that before we get to the Flint stuff. You know, we – you talked about broadband internet access, replacing lead lines, free college for a lot of folks, replacing the roads, universal pre-K, universal childcare, and I assume we’re going to talk about healthcare at some point. Have you done the math on where – how does this – can you give us some specific numbers about how much do you think these projects are going to cost? And you know, you’ve talked about – what you said, increasing taxes on the ultra-rich, prison reform, stopping some business subsidies. Can you give us some specific numbers on how that would balance out? Shri Thanedar: Sure, sure. So, there is like Snyder taxed the pensions and gave a $1.8 billion corporate tax break when he first came to Lansing. So, having run businesses over the last 26 years, what businesses are looking for is good infrastructure, a skilled workforce. Not a little bit of a tax break. And so, I would reverse a lot of that. Will probably generate somewhere between $2 and $4 billion from corporate taxes. We will certainly save, at a minimum, half a billion dollars from minimizing corporate giveaways as far as tax incentives. We will – you know, from prison reform, we would save somewhere between $250,000,000 to $500,000,000. So, we will have a substantial saving, we will have the money coming from the municipal bond, and we would gradually increase. And as we invest in our state and our economy prospers and as we collect more revenues, more money would be available to add. So, this will happen over the next eight years in a gradual manner as we raise our revenues, as we cut down some of the spending. It’s going to be a combination of some additional tax revenues, as well as some savings in terms of how we spend our dollars. Riley Beggin: Okay. As the recovery efforts continue in Flint, what have you learned from the situation there? And how would that inform what you do as governor? Shri Thanedar: Well, I would work on repealing or eliminating the emergency manager law. I would provide free healthcare to every Flint resident that was poisoned by the State. I would specifically pay attention to children who may have a learning disability and I would work with them to have more customized education programs so that the children’s learning disabilities caused by the lead poisoning will be compensated to make sure that they acquire education and we empower them to live productive lives. I would also watch very carefully for any mental health effects as a result of the lead poisoning. And we need to watch people’s health numbers over a period of five to ten years. Because some of these ill effects of lead poisoning we may not know for another five to ten years. Ed Moore: Okay, we’re going to move on to questions about water control. Steve Carmody’s got the first one. Shri Thanedar: A number of things, a number of things. First and foremost, I would work with our Attorney General to shut down Enbridge Line 5. It is a 60-plus-year-old pipeline. The coating on it has gone bad. It, in my mind, is a ticking time bomb. And if that line ever breaks and the Great Lakes get contaminated, you’re looking at somewhere around $6 billion of cleanup cost. And we certainly do not want another disaster like Flint in the State of Michigan. So, I would shut Enbridge Line 5. I will ensure that corporations like Nestle do not take our water for nothing. They pay about $200 and take hundreds of millions of gallons of water. And I would charge them a fee and use that money to keep Great Lakes clean and pure. The Asian Carp entering into our waters, we need to find a technological solution to ensure that Asian Carp do not enter our waters. Certainly, we need to look at corporation pollution. Many corporations leave toxic chemicals. Some of the fertilizers are left on the ground that eventually gets washed into our waters, causing toxic algae. We need to look for and hold corporations accountable that pollute our air or water. I am a PhD chemist and I have run chemical testing labs. So, I’ve analyzed water and soil and air with my own hands. So, a lot of what I talk is not just talking points but I’m talking from my lifetime experiences not only in terms of science. I’m a scientist and I believe science matters in terms of how we keep our environment clean and pure. And I will bring my scientific mind, my scientific background, to ensure that Michigan State environment is clean and pure. Ed Moore: Hassan, could you pick up on the industrial chemicals? Hassan Khalifeh: Right. So, you had talked about contamination by industrial corporations and Enbridge 5, which isn’t the only threat to the Great Lakes. Can you talk specifically how you would combat contamination by industrial sources? Ed Moore: So, we’re going to stick with Hassan but we’re going to switch gears a little bit and start to talk about immigration. Hassan Khalifeh: So, you know, you’re no stranger to this. You immigrated to the United States yourself. Governor Snyder established the Michigan Office for New Americans in 2014 to help retain and attract talent. And he also established June as Michigan Immigrant Heritage Month this year. What specifically would you do to help attract more people to Michigan? And I wonder if refugees would be a part of that. Shri Thanedar: Possibly, yes. Certainly, I would have much more compassionate policies. I also would have policies that will economically benefit the State of Michigan. So, I would encourage immigrants to come to our state and invest in Michigan, start new businesses. I have read statistics where a ton of our businesses are started by immigrants. Personally, I have created hundreds of jobs and I have started businesses, grown businesses. So, I understand how jobs are created and how it is essential that people skilled in technology move to our state and spur up and contribute to the growth of our economy. And I would encourage, I would provide them the visas that they need to be able to start new businesses or be gainfully employed in our technology businesses. Michigan businesses need to be competitive with globally. And that means we need to have the best of the best. We’ll do it twofold. One is we will bring technical career education and we will provide Michiganders the skillset that they need through community colleges and through four-year colleges and special programs to educate and train. At the same time, the growth is going to be so fast that it may not be possible to create enough skilled employees within Michigan. So, we will want to encourage – and I would encourage – others to move into our state and contribute to making our businesses more competitive. Hassan Khalifeh: And again, would refugees be a part of that plan? And what are your thoughts on the kind of wishy-washy stance of refugees in the government? Shri Thanedar: Well, again, as far as the refugees are concerned, we need to have a big heart and we need to have some compassion. You know, I came as an immigrant. I came to this country with $20 in my pocket and a big dream. And this country of ours welcomed me. The State of Michigan gave me so many breaks that I could achieve my American dream. And that American dream is denied to too many people today. And one of the reasons why I’m running for governor is because I will help others achieve that American dream. And I think I appreciate the United States. I appreciate what Michigan has done for me. And that’s why I sold my business, gave it up, so that I can devote the rest of my life to public service. And this is what happens. This is a win-win situation. We are a nation of immigrants. And one of the reasons why United States is the greatest country in the world is because the way we have always welcomed immigrants to our country. And I will have a welcoming policy in the State of Michigan. Ed Moore: Okay. We’re going to move on to taxes now and tax incentives. And our first question is from Riley. Riley Beggin: Many people in our audience want to know about taxes, insurance, and finance issues. From our audience member, John, do you believe that economic development deals with tax credits, incentives, etc., are necessary and useful for Michigan’s communities? What’s your position on tax incentives? Shri Thanedar: Well, for the most part, I think the tax incentives have not worked. For the most part, giving tax breaks and tax incentives for businesses to come and move to Michigan has not added net jobs. If you look at the business disclosures and when businesses move out, jobs get outsourced, automation comes in, robotics come in. The net gain of jobs is essentially zero. Look, we are about 300,000 jobs shy of the level we had prior to the Great Recession. So, even though this governor talks about job creations, we are way behind in job creation and we are way behind in creating good-paying jobs. And many of the jobs that happened, happened in the automotive industry and that’s because of the incentives the Obama administration provided. So, I believe that the key to economic prosperity is through improving our education, giving the skillsets Michiganders need to be ready for tomorrow’s jobs. I would minimize the tax incentives given to big corporations. I would bring a great level of transparency in the MEDC. I would ensure that MEDC in the back room without transparency does not conduct and give away sweetheart deals to big corporations. Ed Moore: Next question, Steve Carmody. Stephen Carmody: The economy’s doing well right now but a recession is likely, probably in the next four years. How would you position Michigan’s government to be prepared in case a recession hits? Shri Thanedar: One of the things that I would do is institute a substantial infrastructure improvement plan. Michigan really needs a huge amount of infrastructure improvement. And as the recession begins, I would use some of the bond money to initiate jobs in the construction industry. That would generate hundreds of thousands of jobs, which will counteract any economic downturn that we may see. Again, I must point out among the three Democratic gubernatorial candidates, I am the only one that has any kind of job creation experience. I’m the only one that has created jobs. I’m the only one that has run a small business. I’m the only one that has made payroll every two weeks. The others have just had their jobs. So, I bring a level of financial expertise and financial savvy to this job that my competitors in the Democratic Party do not bring. Stephen Carmody: Just a quick followup. Your plan to increase corporate taxes, could that be a problem, though, if the State runs into another recession by discouraging businesses from investing in Michigan? Shri Thanedar: Again, not really. Businesses aren’t really looking for that little bit of money from tax incentives. I think what they really need – and I speak from experience. This is not talking points again. I speak from experience because I’ve run businesses, I’ve grown businesses. I was the Entrepreneur of the Year. I received an award three times from Ernst & Young. So, I have experiences in running businesses, creating jobs. And what you need to create jobs is not that little bit of a tax incentive at the end of the year. What you really need is skilled workforce. And that’s what I want to do. What you really need is the graduates need to stay in our state and we need to create incentives for them. More than 60% of our jobs are created by small businesses. But if you look at most of the incentives given, are given to the big, multi-billion-dollar corporations. And that approach has not worked and it will not work. We need to create an entrepreneurial culture, we need to encourage and inspire our young people to be entrepreneurs, and we need to invest in small businesses, which create most of the jobs. So, my focus will be diametrically opposite of what Rick Snyder has done. I will be investing in your young people to start new businesses, I will be creating a startup culture, and I will be focusing on small businesses, which is how I am. I haven’t run billion-dollar businesses, I’ve run small businesses and grown them and created jobs. Ed Moore: Got a question about car insurance and we’re going to switch over to Sascha Raiyn. Sascha Raiyn: Debbie and Ray in our audience want to know what your plans are for car insurance and specifically, how you would lower the rates. Shri Thanedar: Well, I want to ensure that insurance companies do not use non-driving factors such as redlining where you live, the ZIP code that you live, your economic or marital status, your education, your credit score. None of that should be a factor in deciding your car insurance. I would also bring greater transparency in the MCCA that adds a premium to our insurance rates. I want to make – provide people an option in terms of what services they want from the insurance and what they’re willing to pay for it. So, a little bit of a cafeteria plan is something that I would offer. But I would ensure that insurance companies are not taking advantage based on geographic locations. And a lot of times when they do that, it affects the people of color and it affects people of poverty. And I will ensure that they don’t take advantage. Ed Moore: You mentioned regional transit a little bit earlier and Sandra Svoboda has a question about that. Sandra Svoboda: We do have a diverse state in Michigan with suburban areas and a lot of rural areas, as well. So, as you think about transit between the RTA in Southeast Michigan and what the rest of the needs are for the State, what kinds of policies do you have planned? Shri Thanedar: Again, my focus is on taking our infrastructure to the next level. And I believe the more investment we do in our infrastructure, the better our state is going to do from an economic prosperity. And mass transit is absolutely a big part of that. And like Steve’s question, you know, I would ask other counties to look at this as one big family. So, Oakland and Macomb need to chip in and we’re all in it together. And we all do good or we all come down. And so, we need to contribute. And success of Detroit is very, very critical. Detroit is one of the most important cities in our state. And when Detroit succeeds, we all succeed. And it’s important that we have mass transportation. We need to ensure that we expand the bus routes, we bring in light rail, and we take our transportation to the next level. And that’s one of the factors for the Millennials to want to stay in our state and stay in our urban areas. And transportation will also help businesses want to move in because they have ready access to skilled employees. And so, that’s my approach going to be. Not give money away in tax incentives to big corporations but invest that into our people, invest that into our communities, invest that into the facility improvement. And when we do that, that’s what’s going to increase our GDP, that’s what’s going to increase our economic activity. Ed Moore: Hassan has a question about trade in Canada. Hassan Khalifeh: Canada is Michigan’s largest trading partner and the tensions between the US government and Canada maybe could impact your relationship. Do you think that it could? And how do you think you could work through that? With you and your counterpart in Ontario. Shri Thanedar: Well, we need to have a fair and level playing field. So, we need to ensure that there are fair trade deals. And to the extent the trade deals are not fair to the United States and our working families, then, we need to renegotiate them. When we negotiate a trade deal, we must make sure that labor is part of that negotiation. And often, what happens in trade negotiations are that they are sided or more focused or benefitting the corporations more so than the workers. And the workers’ interests are not considered often in trade negotiations. So, I would like it to be a fair and level playing field and we will ensure that the trade policies do not hurt Michigan businesses. Ed Moore: I’ve got a question about transparency from Riley Beggin. Riley Beggin: What are your thoughts on the Voters Not Politicians initiative? Shri Thanedar: Oh, I fully support it. It’s a great initiative. I expect it to pass. And as Governor, I look forward to redistricting and restoring Democratic practices back in Michigan. Sandra Svoboda: Michigan recently got the lowest rating among all the states in an index of transparency. So, I’m interested in what your efforts would be, if any, to raise that. Maybe specifically, with the Freedom of Information Act and Campaign Finance Disclosure. Shri Thanedar: Well, certainly. So, I would make sure that my office is subject to the Freedom of Information. And I will voluntarily do that and set an example of transparency. We absolutely must bring transparency and ethics. Campaign financing is a big concern of mine. We have in Lansing a pay-for-play culture. We have seen influence of dark money, we have seen influence of lobbyists, we have seen influence of corporate dollars and how that has corrupted our politicians and our government. And I would want a much higher level of transparency. I started with my own example. I’ve lived a life of transparency. I’ve taken a pledge not to accept a single penny from corporations. And I would hold the lawmakers accountable. And I would bring campaign – I would support campaign reform. Today, we’re spending way too much money on elections. Our election cycles are very long and that means candidates spend 20, 30, 40 hours a week collecting money from rich people. And then, all of that influences, they go to Lansing beholden to all of those influences. I will not do that but I see others collecting money. And we need to make the whole election process shorter. We want to make that less dependent on corporate money or larger money and contribution from the wealthy. Ed Moore: We’ve got a question regarding marijuana coming from Steve Carmody. Stephen Carmody: This fall, Michiganders will be voting on legalizing recreational marijuana. Would like to know what your thoughts are on that. And if it was to pass, what would you do as Governor to make sure that this actually works? Shri Thanedar: Well, first of all, I am fully supportive of the ballot proposal for recreational marijuana. Once it passes, I would use my authority and my power as a governor to pardon those who are in prison, nonviolent offenders for small possession charges. I would commute those sentences, I would expunge their records, I would provide them the skillset they need to return to society and become productive members of the society. So, my focus is going to be on expungement. I will ensure that public safety is maintained while we allow entrepreneurship and I will make sure that big corporations from out of state do not come and take advantage of this new law. But local entrepreneurs are able to take advantage of this new opportunity and I would like to economic prosperity to come as one of the – growth should be in the cannabis industry. Stephen Carmody: Do you have any concerns about the potential effects societally on Michigan of allowing recreational use? Shri Thanedar: I believe that marijuana should be regulated in a manner similar to alcohol and there should be strict guidelines in terms of the levels of cannabis in the bloodstream. And we need to use science to ensure that we set appropriate regulations and standards so that public safety is maintained. Ed Moore: Okay. That was a lot of fun but we’ve got even more fun in store for you now. With our fun questions, we’ll start off with Sascha Raiyn. Sascha Raiyn: We want to know what cars you have in your family, what cars you drive. Shri Thanedar: I think I have a Ford car and two GM cars. Shri Thanedar: Yes, I think. Hassan Khalifeh: Just going back to the race a little bit, can you think of an interesting or a touching moment you came across with a voter along the campaign trail? Shri Thanedar: Yes. I have met many voters, I’ve met teachers – teachers that have tears in their eyes when they describe to me how they get evaluated, how principals come to the classroom with a calculator and evaluate their performance, how they get humiliated with the test scores, how their salaries haven’t changed for the last ten years. And yet, I met these teachers in an Office Max and they’re buying supplies for their own school projects out of money from their pocket. And I’ve met numerous seniors who are spending a big chunk of money on prescription medicine and people are paying hundreds of dollars. Especially, I met a woman who had – was diagnosed multiple times for cancer. And despite being on Medicare, she has several bills sent and she’s paying so much money on prescription medicine, that’s causing her not to be able to take care of her finances. People are hurting. You know, even though our Governor talks about economic prosperity and job creation, a lot of people that I’ve met, all across – in Bay City, I met a young woman, she had a job in a manufacturing factory. Her name is Tammy. And she lost her job because the manufacturing company went all automation. And she now works at Taco Bell making $8.50, a single mom, she has two little girls. And that’s no life to live. And we need to give people skillsets so that they can be ready for tomorrow’s jobs as automation comes in, as robotics comes in, and jobs get outsourced. Shri Thanedar: A number of books. But you know, I’m campaigning 24 hours, as you can see. Every waking hour, I’m campaigning. But I’ve read a book recently about, that one is Good to Great, which I learned how to take something that’s good, which is like the State of Michigan, and make it great. I want to make Michigan into the top 10 states in the United States. Sandra Svoboda: What is your favorite Michigan food? Shri Thanedar: Well, when I go to Mackinac Island, I eat a lot of fudge. Ed Moore: And Steve Carmody? Stephen Carmody: When you’re not campaigning – I know it’s been a long time – but when you’re not campaigning, how do you like to spend your weekend? What makes for a good weekend? Shri Thanedar: Well, I and my wife, you know, her favorite activity is just sit in the backyard, have a cup of tea, and talk. And we do that, we watch movies. She loves to take walks in the neighborhood, you know, and we do that. Just simple little things. My wife is very simple and she has very small, simple expectations. And sometimes I feel bad because I’m traveling and campaigning all the time and I don’t get to do that. But lately, she’s been on the campaign trail with me so, she and I travel together many times and we spend a lot of time. And the voters love her because she’s very kind and, you know, she’s very warm and very sweet. And so, I think the voters like her a little better than the like me. I get jealous of her sometimes. Stephen Carmody: So, basically, whatever makes your wife happy, that’s what you want to do. Shri Thanedar: Well, it’s her time and so [laughter], I’ve been out of the house enough and doing things and I want to make sure that I spend some time with her. And whenever we can in our family visits, grandson visits, we spend time with them. Ed Moore: What was your first job? What was the first way you made money? Shri Thanedar: Well, when I was working on my PhD, I was a teaching assistant so, I taught undergraduate labs and they paid me $300 a month. So, I would take $75 out of my $300 every month and send it home so, my family can put food on the table. And they’ll pay me for nine months because we have labs to teach. But in summer months, there are no labs to teach so, I wouldn’t get paid. So, the jobs on the campus, I can only work on the campus because I was an immigrant. So, I would work in the cafeteria, serve food. And I saw a waiter carrying so many plates and just walking around so, I thought I should try that, too. And I did that and someone sort of opened a door on me and it all broke into pieces. But in the three months in the summer, they would pay me. And so, I couldn’t keep my apartment and then, I would go sleep in my car during summer. And when it got too hot in the car, I would go sleep in the public buildings. That was my very first job in America. Ed Moore: Well, I want to thank you for taking time to talk with us today. That concludes our conversation with Democratic candidate for Governor, Shri Thanedar. Many thanks to the John S. and James L. Knight Foundation for our support and on behalf of the Detroit Journalism Cooperative, I’m Ed Moore. Thanks. Shri Thanedar: Thank you, Ed. Thank you, all. Education: Talk about your vision for education, stop blaming things like charter schools, tests and teachers. Charter schools receive money from the state in the same way, that traditional public districts do. Parents as taxpayers decide which school is best; the funding is for their student. They don’t take money from districts and charters teach the same kids. All charter schools are non profit, public schools. Some charter schools contract with companies to provide goods and services to the schools. Some of these schools are the highest performing schools in all of Michigan. Charter schools have all the same accountability as traditional schools do now. Michigan needs a system that puts kids first, not bureaucracy, we need to give teachers freedom to teach and we need to give every parent the chance to send their child to the best school possible. That’s what charter schools do. I saw this guy speak at the SBAM annual meeting in Lansing and this guy regardless of how much money he can throw at the primary will be a loser. He's got a ton of baggage like his heavy heavy accent, he lost his business and let the poor animals his company was running experiments on suffer in their cages in his foreclosed building and the list goes on. How can the Dems think this guy is a viable candidate at any level? He isn't coherent on any issue either. Seriously, I heard him speak for 5 minutes at SBAM and all he talked about his is family, his business (but didn't talk about its failure) and how nice of a guy he is. That's not a winning strategy.